Today, big data can make a big difference for restaurant brands and the industry is finally realizing that the copious facts and figures they collect can help maximize their marketing and boost their business. Big data is much more than a high-tech trend, but a fork in the road for restaurant marketing that is changing the way brands serve and succeed. To show how big data can serve the industry’s best interests, QSRMagazine.com dished out the following findings. To understand big data, it’s important to know the difference between structured and unstructured data. Structured data is the internal information from a restaurant’s operations, from sales figures and social media comments to supplier logistics and loyalty statistics. In contrast, unstructured data examines the external forces affecting business, from traffic patterns and weather conditions to demographics and current events. Since all of these impact sales and success, branding experts can analyze this flood of facts to gauge their progress and plan their direction. The key to leveraging big data is knowing how it factors in when planning marketing, advertising, and operations. It all comes down to recent advances in analytics, which are helping brands gain major insights from their information. While the tech giants and big brands have this science down to a science, more industries are starting to see that big data is big business no matter the size of the brand. And restaurant brands are lining up to get a piece of the pie. Now, restaurants can easily tap their stream of data to find high-traffic times and top promotions. Social media is especially useful for gauging reactions to new promotions and products. Through this digital personal feedback, restaurants can better manage their operations and make adjustments to their advertising and branding. So what’s the big picture in big data? Experts agree that it’s all a matter of ROI and how the data affects the bottom line. 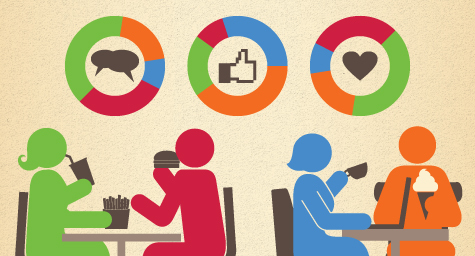 Keep up with the latest dish in restaurant marketing. Contact MDG Advertising today at 561-338-7797 or visit mdgadvertising.com. MDG Advertising, a full-service advertising agency with offices in Boca Raton and New York, NY, is one of Florida’s top branding firms. MDG’s core capabilities include print advertising, branding, logo design, creative, digital marketing, media planning and buying, radio and TV advertising, Web design and development, online video advertising, email marketing, content marketing, social media marketing, and SEO. For the latest trends in restaurant marketing and branding, contact MDG Advertising today at 561-338-7797 or visit mdgadvertising.com.